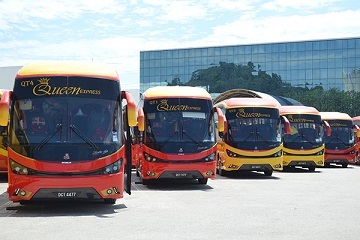 Queen Express is one of the bus operators that has been actively providing bus services that mainly travel from the two states of East Coast Malaysia, Kelantan and Terengganu. Thousands of passengers opt to use bus services offered by Queen Express because it ensures an efficient and safe travel journey. Queen Express operates well-maintained express buses with its bus routes running to some of the popular destinations in Peninsular Malaysia. 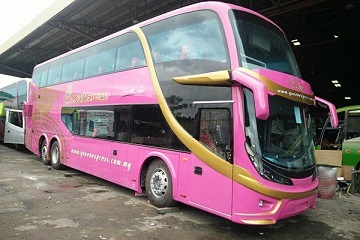 The buses mostly depart from Terengganu and Kelantan as the operator is based in Kelantan and they have eight ticketing counters in Klang Valley area, such as Greenwood, Putrajaya, Kajang, Serdang, Bentong, Shah Alam, Nilai and Seremban where passengers can purchase their tickets. Queen Express is missioned to maintain and improve their level of services so that more passengers will travel with the company. With comfortable fleets used to transport passengers to various destinations, the company assures travellers to arrive safely at the destination. 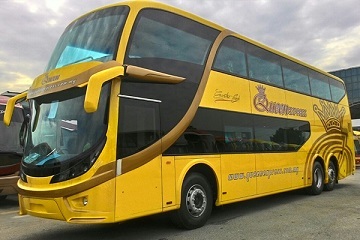 Like other passenger coaches, Queen Express offers both single and double-decker buses. Single-decker buses can accommodate up to 30 passengers per trip while double-decker buses can carry 48 passengers at most. Each coach is designed in a comfy and spacious seating arrangement. The facilities provided on board include air-conditioning system, ample legroom, Wi-Fi connection as well as charging ports to give passengers a pleasant journey to their preferred destination. Travel duration takes an approximate time of around 7 to 9 hours and it entirely depends on the traffic conditions. Despite the long hours, passengers will feel comfortable as the bus is furnished with good amenities. The bus ticket is ranged at affordable prices according to the travel route. Travelling by bus is now made convenient and easier with Easybook online booking platform. Travellers can save more time and energy from buying the ticket over the counter as with Easybook, bus ticket can be purchased online within minutes at home. To secure bus tickets without any hassle, head over to Easybook website or install the mobile app to search for bus routes. Bus schedules and other travel details such as ticket price and travel time can also be reviewed on the screen. Kaunter No.12, Terminal Lembas Sireh, Kg. Sireh,15050 Kota Bharu, Kelantan.